Anytime my 2-year old sees a tool bench , he heads straight for it. It doesn’t matter how many of his best friends might be there, he just wants to hammer, screw, saw, and drill. He’ll carry the hammer everywhere (scary, but at least it’s plastic…), but ultimately always ends up back at the tool bench working on the nails. It’s really adorable. 🙂 And it looks just like the adult version, which makes it even cuter. Every week I take my son to a toddler play group at our library. And every week, the same thing happens – every single child fights over who gets to play with the Count & Learn Cookie Jar . They can’t get enough of it! The cookie jar works like a piggy bank, so you have to hold the cookie a certain way to fit it into the slot. These kids will sit for the entire hour taking turns putting the cookies in the jar. I don’t know how they figured it out, but this cookie jar is a huge winner and a great gift for a 2-year old boy! My son is OBSESSED with our bubble machine. And I have to admit, so am I. Not only do I think back to my childhood days when I would have done anything to have such a cool toy, but now as a mom, I don’t have to blow the bubbles for him! This is such a great way to get your toddler outside and running around. Of all the gifts on this list, this might be the best gift for a 2-year old boy! This is another big hit at the library play group and the kids can’t get enough of it. Not only is it fun for my son, but the absolute greatest part is that it folds up to the size of nothing so I can easily put it away when he’s not playing with it (OR travel with it). He will crawl though it, roll in it, and sometimes just camp out in it. This can also be thrown outside for some new outdoor fun. Not only is the wagon a huge hit with my son and all of his friends, but it also has a great practical element – you can pile them all in when you’ve got somewhere quick to go! It’s way less hassle than a stroller and my son finds it really exciting. He will also try to pull it himself which is an activity all on it’s own. And it’s nice to know we have a gift on our hands that will be used for many years to come. 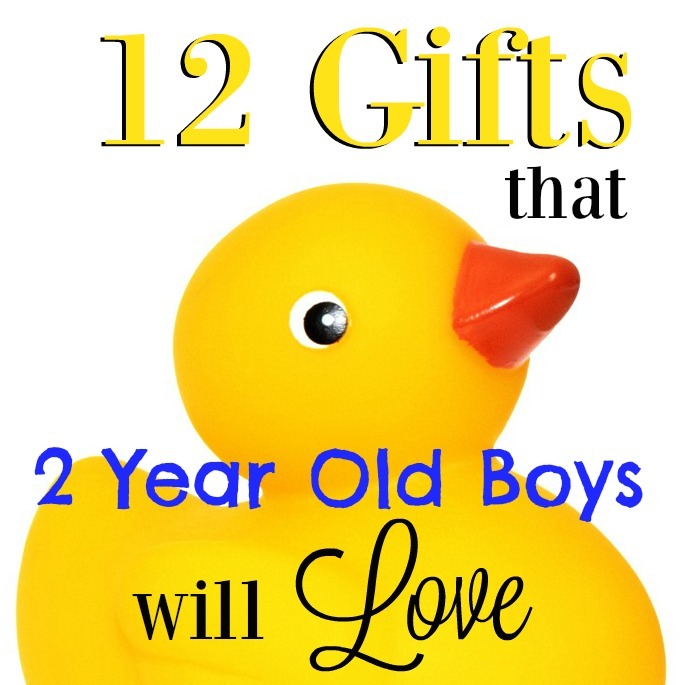 This one isn’t a shocker – it’s an obvious gift idea for 2 year old boys. In fact, I think it’s an inevitable part of having a child (even a boy!) – they need their own kitchen set. And 2 years is when they start to love it. What is great about the kitchen sets nowadays is that there’s a huge range of options you can pick from (and they aren’t all girly…because the boys love them too!). There are small ones (for people like me living in small houses), trendy ones , vintage ones , and even massive walk-in ones . These are a ton of fun for the kids and of course come with a ton of extra gifts you can add on – groceries , shopping cart , dishes , etc. My son has always liked books, so I keep trying to buy as many as possible, but he gets pickier and pickier as time goes on. When he finds a favorite though, there’s no question about it because he will read it over and over and over. That is exactly what he does with Dear Zoo . He LOVES this one. It’s interactive and simple, so it’s really no wonder why he loves it so much. Another classic to add to the collection! First 100 Words is definitely one of the greatest books of all times for toddlers and at the top of my son’s favorite book list. The whole book is just pictures, so it’s perfect for little guys that are learning to talk. My son will spend so much time flipping through it to find his favorite images and try to learn the words. It’s also a board book (aka nearly indestructible) and small enough to easily fit in a purse. This is definitely one to add to the collection. And if your 2-year old is already a huge fan of First 100 Words, check out the fun “sequel” – First 100 Animals . Books are always great gifts for 2-year old boys! I was torn about putting this on my list because you really could give them this gift well before they turn 2. 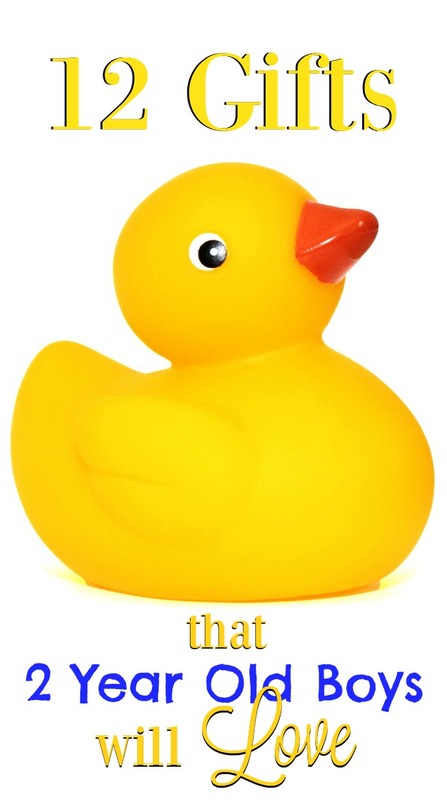 BUT…this is still my son’s absolute favorite toy, so if you’re 2-year old does not have Mega Bloks , GET THEM THIS. He will sit and play with these blocks forever and since they come in a great bag, we can take them with us when we travel. Yay!! A classic that doesn’t involve batteries that 2-year olds LOVE. These are the Barbies for little boys. Just like the Mega Bloks, my son will sit and play with his Mr. Potato Head for hours. He’ll even sit in his highchair while I do dishes if I load it up with Potato Head parts. And there’s a ton of fun and cute Mr. Potato Head extras that you can get if your little guy already has the basics. This is a big winner! Not only is the Cozy Coupe my son’s favorite outdoor toy (only because we have a small house – most people keep theirs inside :)), but it is pretty much everyone’s favorite toy when we have play dates. What is so great is that he doesn’t just push himself around in it. He will get in and then out, in and then out, and on and on and on. Then he’ll turn the key, beep the horn, and play with the gas nozzle. It’s a great interactive toy and another battery-less classic (not to mention how fun it is seeing my son love a toy that I remember loving!). My son is obsessed with Mickey Mouse right now, so I knew I had to get him a good Mickey Mouse book for his birthday. When I saw one with a piano attached , I got so excited because I really wanted to see if he would start playing it. HE LOVED IT. It was, by far, his favorite gift from me and he has a blast playing with the piano. I got so excited that I went digging around for something similar for Christmas and I found a Mickey Mouse light switch book …that actually has a little night light and light switch! I don’t know about your 2-year old, but for mine, buttons are the new cookie (which means he’ll drop everything if I give him a button to push). This was a great discovery and a huge hit with my son. He loves anything on wheels, but when you add buttons and compartments you’ve created the perfect gift. It’s basically three cars in one and as I said, it’s got buttons that tow the cars and then release them. It’s also got this great mechanism that helps it push itself, which is really fun to watch. So there you have it! 12 gift ideas for 2-year old boys 🙂 Good luck with your shopping!